DisplayLink DL-3000,DL-5000 and DL-6000 products can support Ethernet. Wake on LAN is supported from software version v6.3 M1. Details on how to configure Wake on LAN (and other Ethernet parameters) can be found in the DisplayLink user manual. Wake on LAN will wake the PC from an S3 (suspend or sleep) state. It may fail if the PC turns off the USB connection during S3 on battery power. It will not wake the PC from an S4 (Hibernate) or S5 (Off) state. USB 3.0 Host controllers may not correctly work with Wake On LAN. If Wake on LAN is not working on a USB 3.0 host controller, try a USB 2.0 port instead to see if this solves the issue. 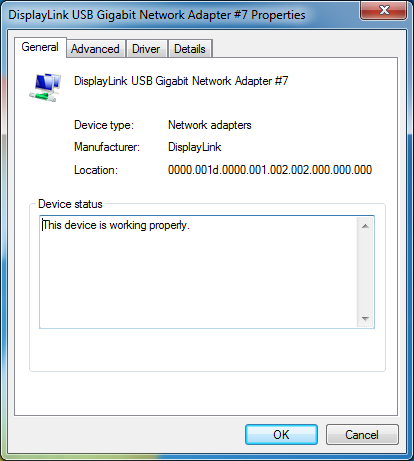 To check if the USB host controller in your computer supports Power management, open the device properties (as described in the DisplayLink user manual for Ethernet, and check there is a "Power Management" tab. If the Power Management tab does not exist, then the USB host controller does not support power management, and Wake on LAN will not be supported from this USB port on the PC. 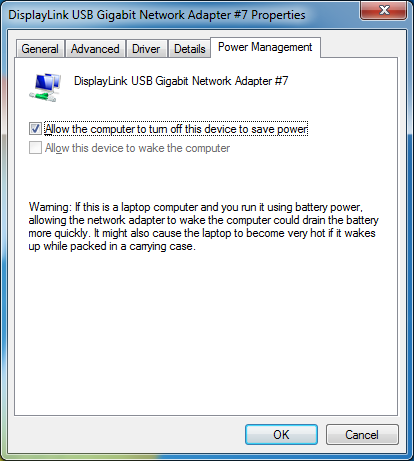 Having found the Power management tab above, click on the tab and ensure "Allow this device to wake the computer" is not greyed out. If this option is greyed out, the USB port on this computer cannot be woken up by a USB device and will not support Wake on LAN.